Sixteen pre-programmed ringtones are stored on the Arduino, with support for loading a user specified ringtone into the Arduino's EEPROM. The user specified ringtone is received through the Serial device. 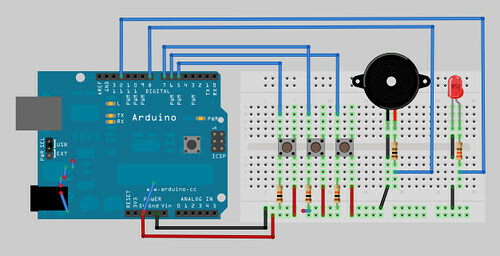 A program written with the Processing programming language receives information describing each note of a ringtone from the Arduino board for visualization as the ringtone is played. When idle, the Processing program displays a ring of darkly colored circles. The ring of circles is intended to simulate a ring of lights. When information describing a note is received from the Arduino, a circle associated with the note is temporarily redrawn with a brighter color for a duration determined by the duration of the note, making the circle appear to blink. The name of the current ringtone is also displayed in the upper left hand corner of the program's window. 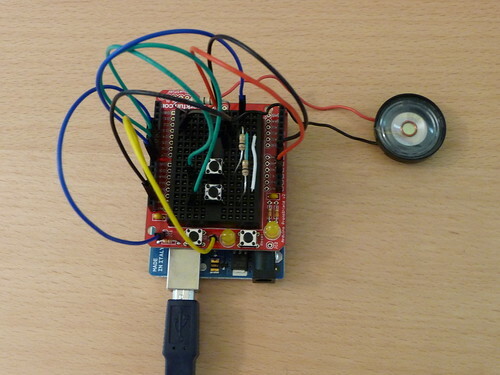 User specified ringtones can be transmitted to the Arduino board with the Processing program. Pressing the space bar will display a dialogbox to which an RTTTL ringtone can be entered. A database of RTTTL ringtones can be found here. The Processing program is also capable of recording video. Video recording is toggled with the Enter key.